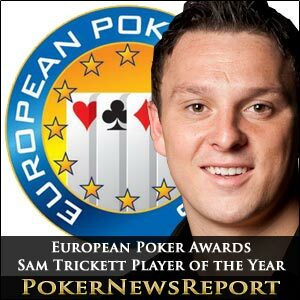 Englishman Sam Trickett has seen off the challenges from Jake Cody, Bertrand ‘ElkY’ Grospellier, Pius Heinz, Eugene Katchalov and Andrey Pateychuk to be crowned Player of the Year at the 2012 European Poker Awards. Titan Poker-sponsored Sam Trickett, who is a high stakes cash games specialist from Nottinghamshire, couldn’t make the ceremony – which was hosted by former European Poker Players Association (EPPA) secretary Nic Szeremeta – at the Aviation Club de France in Paris last night, so sent friend and PokerStrategy blogger Barry Carter to collect his award. Trickett – who secured the Partouche Poker Tour (PPT) main event in Cannes in November for €1 million – is, of course, in Melbourne for the Aussie Millions right now, but will have been delighted to pick up such a prestigious award. It really is an incredible feat for the 25-year-old from East Retford as he triumphed over fellow Englishman Cody – a one-time World Series of Poker (WSOP) bracelet winner – French Triple Crown winner Grospellier, last year’s WSOP main event winner Heinz, of Germany, Russian Pateychuck – who collected $937,530 for taking down last October’s European Poker Tour (EPT) San Remo main event – and Ukrainian Team PokerStars Pro Katchalov, who last year won $1.5 million for lifting the PokerStars Caribbean Adventure $100,000 buy-in Super High Roller tournament. American poker commentator Jesse ‘The Voice of Poker’ May was also honoured with the Lifetime Achievement award in recognition of his assistance in boosting the televised coverage of poker, as well as his general help in promoting the world’s greatest game. Andrey Pateychuck didn’t leave empty-handed, though, as the Muscovite picked up the Rookie of the Year award following his WPT and EPT successes that saw him beat out the competition of France’s Adrien Allain, Heinz, Late Night Poker winner and WSOP November Niner Sam Holden, of Sussex – who is sponsored by 888 Poker – as well as Ukrainian Oleksii Kovalchuk and Pateychuk. 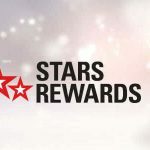 Team PokerStars Pro Pius Heinz was also recognised after winning the Best Tournament Performance for his triumph in the November Nine. Bonn’s Heinz was joined in that category by Rochdale’s Cody – a Team PKR Poker Pro – and Frenchman Fabrice Soulier, fellow German Benny Spindler and Trickett, but really did deserve his triumph after his incredible victory for $8,715,638 at Rio All Suite Hotel and Casino in Las Vegas. Bertrand Grospellier wasn’t left out either after he was awarded the Rob Gardner Memorial Award for the Poker Personality of the Year trophy by beating out English stars Neil Channing and Barny Boatman, May and Lithuanian-Australian legend Tony G.
Finnish star Ilari ‘Ilari FIN’ Sahamies took home Internet Player of the Year by seeing off Irishman Jude Ainsworth, Swedish sensation Viktor ‘Isildur1’ Blom, Frenchman Rui Cao and Englishman Chris Moorman. Meanwhile, Russia’s Natalia Nikitina left with the Europe’s Leading Lady award in a category that also featured England’s Liv Boeree and Victoria Coren, French duo Nesrine Kourdourli and Barbara Martinez, and Italian Cecilia Pescaglini. The Best European Event of the Year award went to WSOP Europe Cannes in a grouping that also included EPT London, the PPT Final, the International Poker Open Dublin, and the World Poker Tour (WPT) Grand Prix de Paris,.